Food on San Salvador Bahamas. 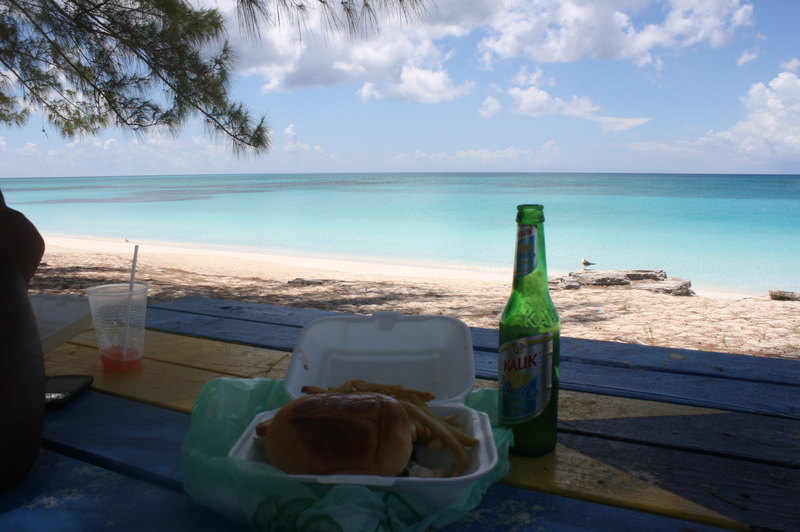 Where to go for dinner or lunch or breakfast, restaurants and take outs on San Salvador in the Bahamas. I was working on my computer all morning long and around noon I needed a break and I was hungry. Got in the car in search for some food. Preferably a cheeseburger which I didn’t have in month. 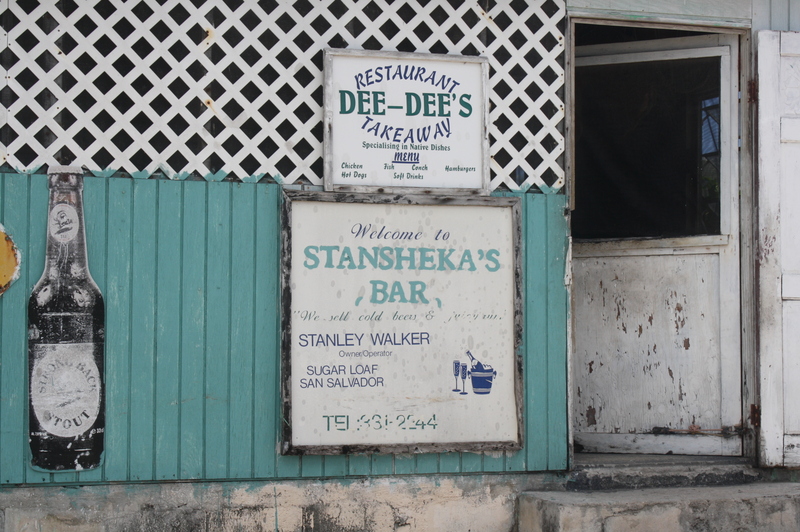 After half a mile or so I ran into Robby and his friend and we decided it was time for a “cold Kalik” so off we went to Stanley’s bar. After that first stop I picked up my friend K in town and we headed for “Carters take out” in Cockburn town but unfortunately they were closed for a few days. Next stop was the restaurant “Paradise” where we chatted a little bit with the police inspector and some other people but Paradise was under renovation and it would have taken hours to get some food. So, we headed over to Hansel’s restaurant BUT we were too early it was still closed. Now we are running out of options …. 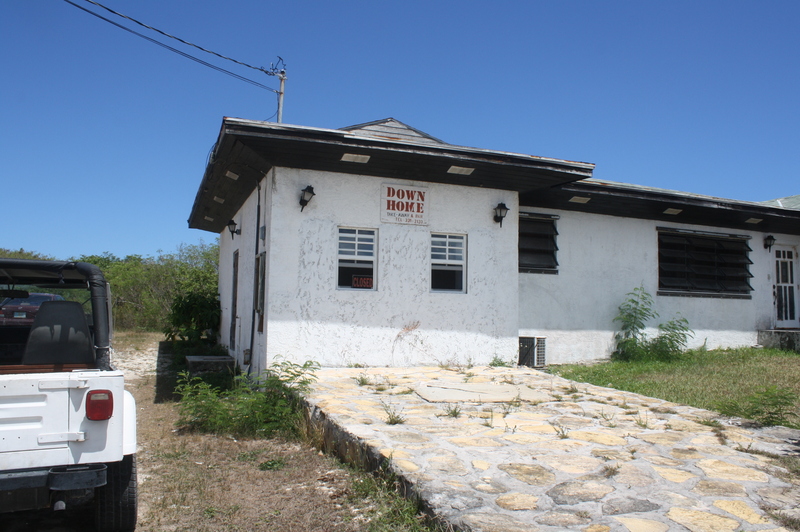 but “Down home” in Sugar loaf (subdivision on San Salvador) answered the phone and we were able to order 2 cheeseburgers. So, off we go to Sugar Loaf but no without making a quick stop at “Zippy” in Cockburn town for another beer. Once we had our burger we went to the Columbus Land fall park, found a nice picnic table in the shade right on the beautiful beach and all of a sudden the day turned into something very special. How lucky can we be to have the best burger, a beer and the most awesome scenery on San Salvador. Soaking wet as we were we wanted to go home but of course we had to stop at “Juice” for one more beer and some good company. Sometimes it is not easy to find the food you want on San Salvador but this little excursion that K and I did yesterday shows you that it is all well worth it! 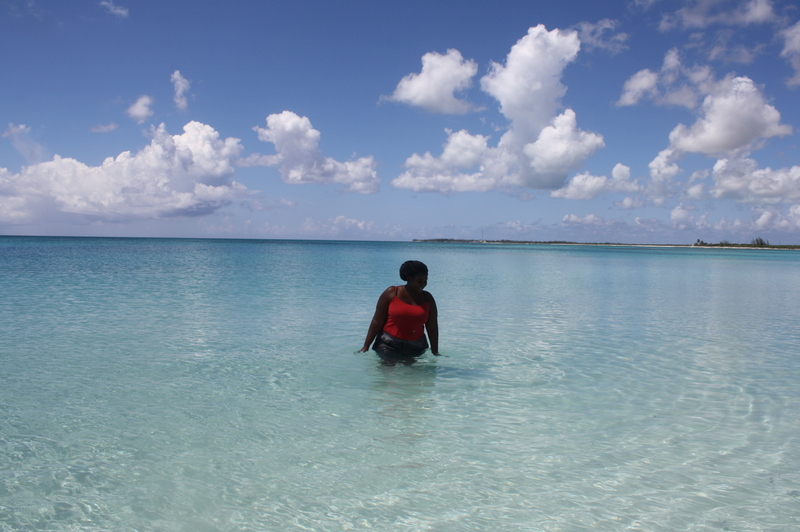 We had an incredible afternoon on this very special Bahamian Island of San Salvador. 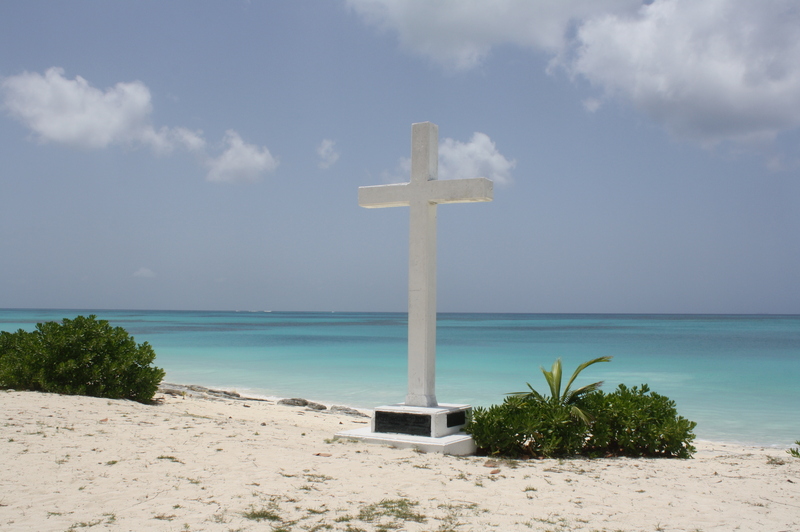 Information about San Salvador in the Bahamas. 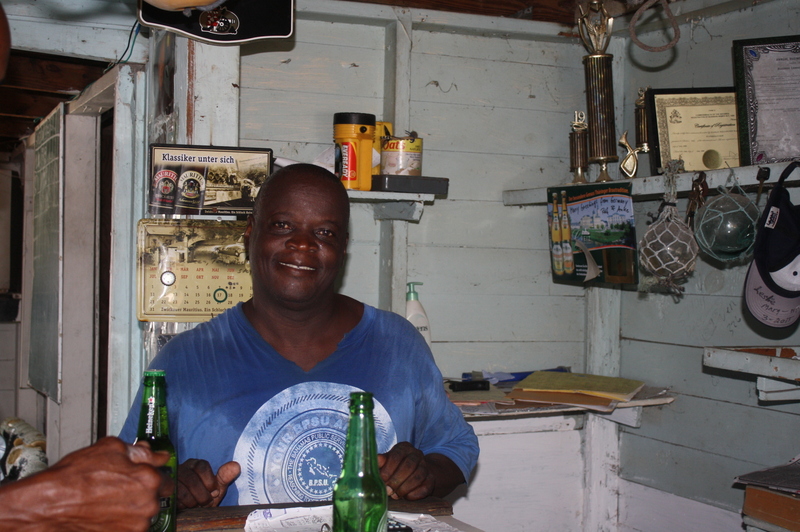 Here you will find answers to a lot of questions about San Salvador, Island of the Bahamas. Shopping, buying property, weather, boating, just scroll down. How do you get to San Salvador Bahamas? Is electricity available on the Island of San Salvador in the Bahamas? What is the drinking water source on San Salvador? Public Reverse osmosis plant is on the island. Some areas are connected. Others have a well and or cisterns. 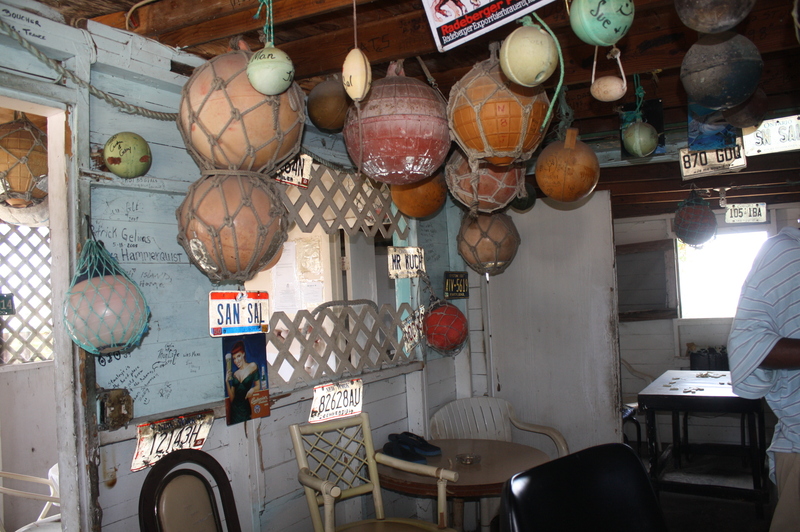 Where can I go for dinner on San Sal Bahamas? 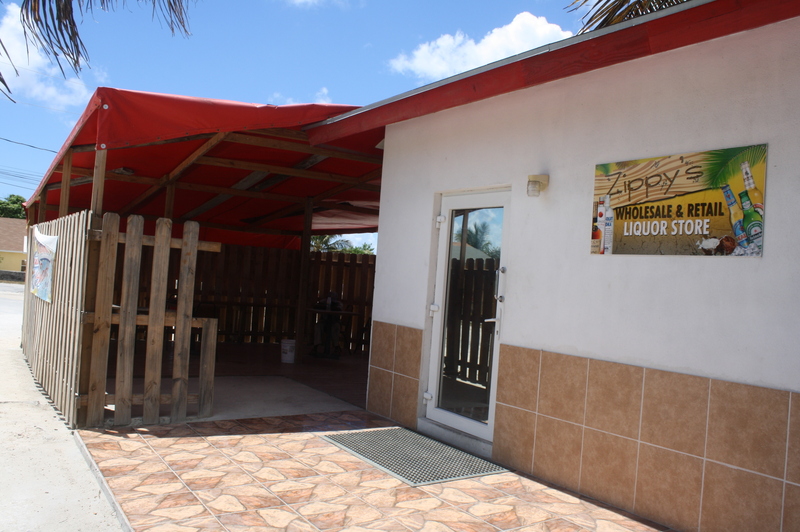 There are several restaurants on the island that offer home cooked Bahamian food. Club med is also a wonderful place to have a great dinner and spend an unforgettable evening. 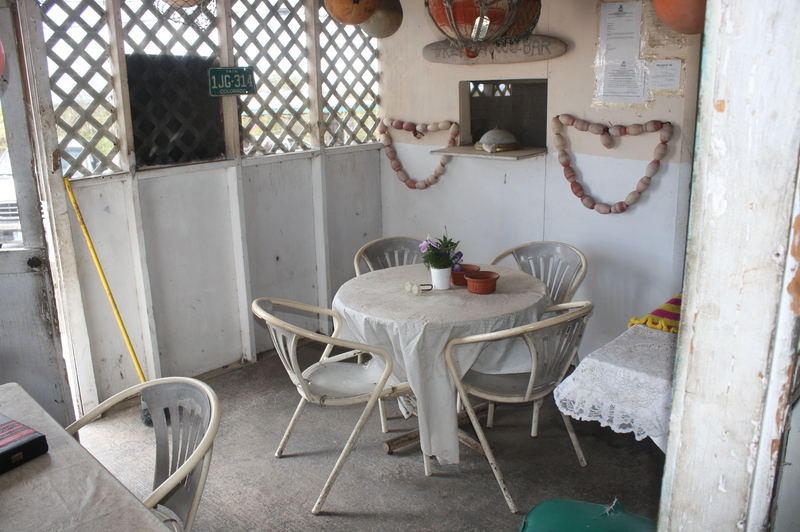 It is open to the public but you should make reservations for dinner or lunch. Is there a cab or taxi service on San Salvador? Sorry, no cab service on the island but there are several rental car companies and shooter and bike rentals. Is there a doctor on the Island? Yes, actually there is a walk in clinic sometimes with a doctor on duty and always a registered nurse. Club med also has a physician on call specializing in diving emergencies. 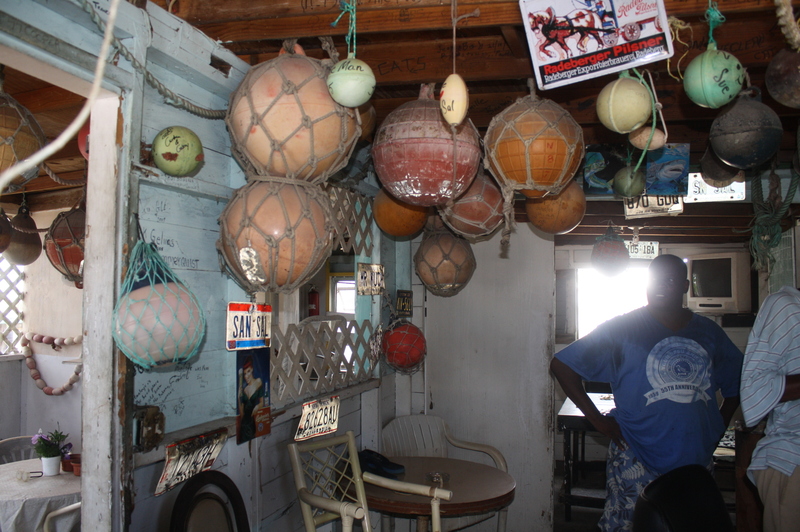 What kind of fish can you catch on the island of San Salvador in the Bahamas? San Salvador is famous for Wahoo fishing. Grouper, Tuna and Conch are also common catches. What is the water temperature on San Sal? Depending on the time of the year the water temperature varies between mid seventies to high eighties, it is wonderful all year around. When was the San Salvador lighthouse built? Built by the Imperial Lighthouse Service in 1887, it is one of the last hand-operated, kerosene-lit lighthouses in the world and the last of its type in The Bahamas. You can climb 160 feet to the top of the lighthouse, which has a visibility of 19 miles. Can I get phone and or internet connection on San Salvador? Yes, there are different possibilities. Land line, Satellite, and fiber optic cable. What travel documents do you need to travel to San Sal? Are there any fishing charters on the island of San Salvador? Yes, two local fishing charter companies. 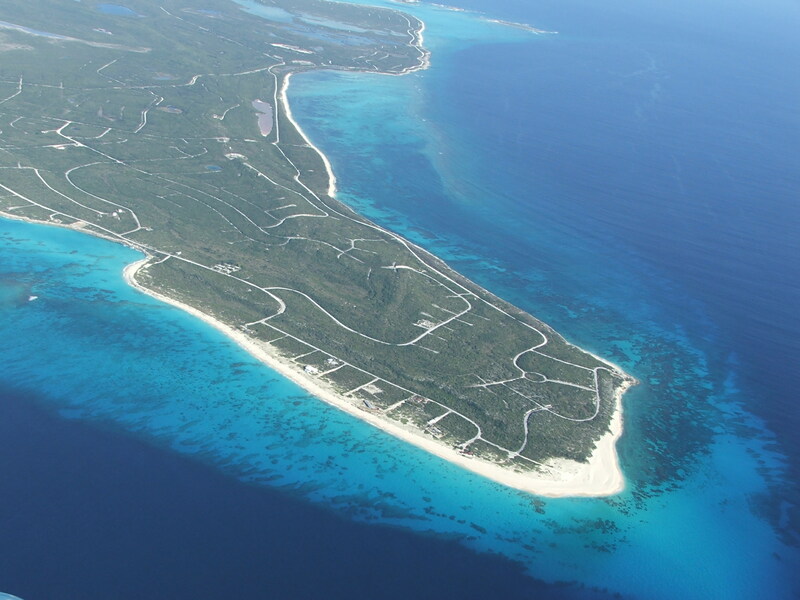 Where is the Island situated in the Bahamas Island Chain? How is the diving on San Salvador Bahamas? Absolutely fantastic, crystal clear water and wonderful reefs. Supposed to be one of the best diving spot in the world. Club Med and Riding Rock offer diving tours and equipment. I hear there is an Olympic Monument on San Sal? Yes, that is correct. Mexican Monument commemorating the transferring of the Olympic flame from Greece to the New World for the 1968 Olympics in Mexico City. 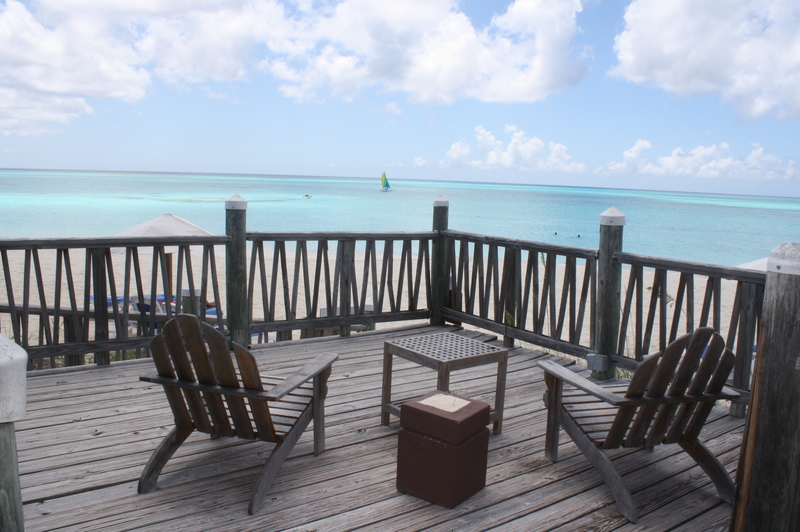 If I buy a piece of property on San Salvador in the Bahamas will I own it free and clear? You have to be a little careful, make sure a lawyer does a title search and guaranties that it is free and clear. And for the peace of mind in some cases I also recommend getting title insurance. Is there a church on the island? Oh yes, there are a lot of churches on San Salvador and each one is unique. How difficult is it to get a building permit? Not difficult at all, when you go with the right contractor he will arrange everything for you. How much is income tax in the Bahamas? Zero, doesn’t´t exist, you do not have to pay income tax. Are the roads paved on San Salvador in the Bahamas? Yes, Queens Highway which goes around the whole Island is paved. Most other roads are dirt roads and some of them are in need of repair. How much is it to build a house on San Salvador? $200 per heated square feet and up. How many boat slips and what size boats can dock in the marina? At the present time about 20 slips at the Riding Rock marina for boats up to 70 feet. Is there an insect problem on San Salvador? No, there are mosquitoes of course like on every other Bahamian island but they only come out at dusk and dawn, use a regular mosquito spray with deed and you will not be bothered. for your home you can buy the coils or the new “OFF” candle lamps, they really work well. No see umms or sand flies or whatever you want to call the little annoying things are also at home on the island but with baby oil or Avon skin so soft you can keep them in check. Nobody has ever seen snakes or other poisonous creatures. How long does it take from the day an offer is made on a property on San Salvador till it closes and title is transferred? It can take somewhere between 3 and 6 month. Can I watch TV while on the island? Yes, absolutely, there are some areas that are connected to cable and others have satellite dishes. Can small private plan also land on San Salvador? Yes, San Salvador airport is a port of entry with an 8000 feet paved runway which is the third largest in all of Bahamas. Big and small plans can land here. Jet fuel is also available. What is the population of San Salvador? Well, my guess is as good as your. Somewhere between 1200 and 1600 people. 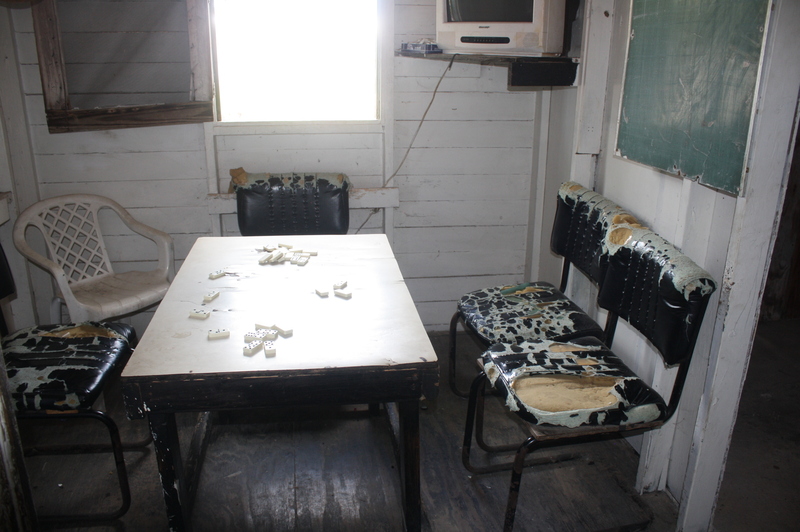 How about schools on San Salvador? Pretty much everything from daycare for babies to high school. What language do they speak on San Salvador? What are the immigration rules for the Bahamas? If I buy a vacant lot on San Salvador and want to build a house where do I get the building material? Is there a police station on the Island? Yes, not that they need it but yes there is one. How does San Salvador get supplies? Usually per ship The “mail boat” comes once a week and “Seacore shipping” and “Tropical” brings containers, cars, equipment etc. as needed. Is San Salvador one of these rocky, sandy Islands with hardly any vegetation? No, not at all. In fact it is very green with lots of lakes and shrubs and little hills, really wonderful. Can I only buy one lot or vacant land or is there any restriction on San Salvador? No restriction at all. Buy as lots or vacant land as you want. Doesn’t matter if it is oceanfront property or inland. You will need investment board approval but your lawyer will walk you through this. It is easy. 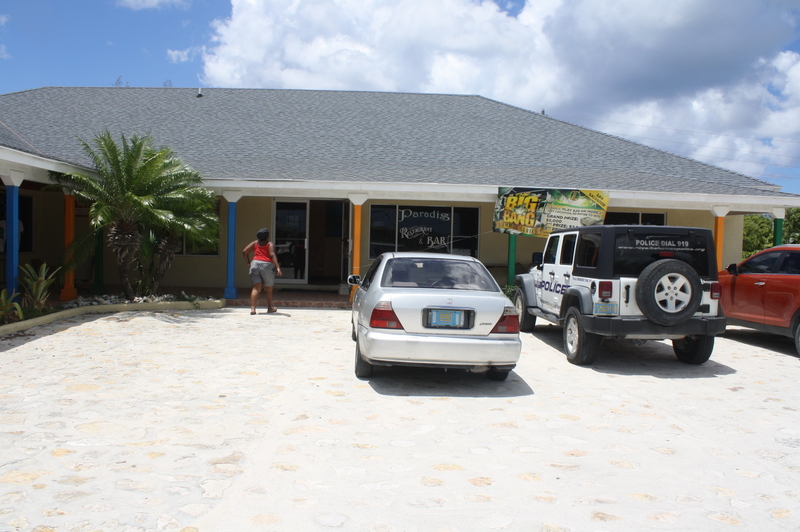 Are there any monthly or yearly fees like home owners association on San Salvador in the Bahamas? Yes and No. Only if you buy a property or vacant land in the south part of the island which is named Columbus Landings then you have to pay about $30 per year. There is also a beautiful new development called SeaBreeze going up on San Salvador with 20 new homes right on the ocean and there will also be an association fee. Other than that I am not aware of any fees. Can I bring my boat to San Salvador? Absolutely, docking is currently available at the “Riding Rock marina” but you can also just anchor a few hundred feet off the island..
What else can I do on San Salvador when I am on vacation? 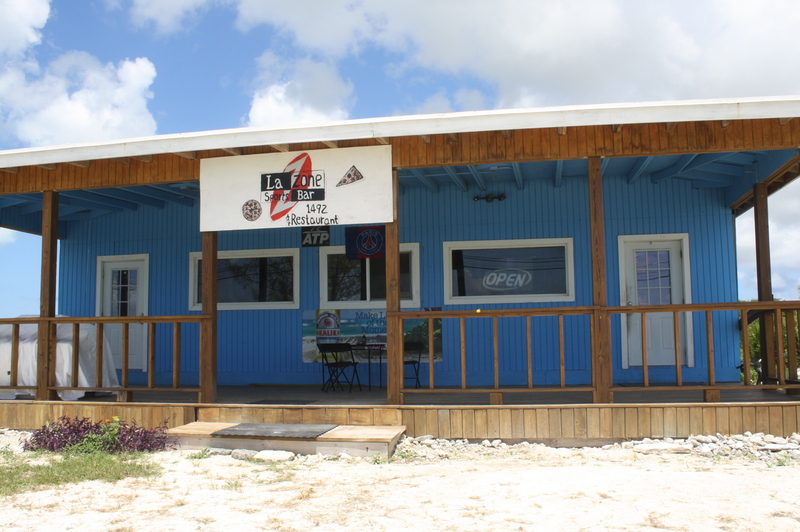 There are lots of things to do, diving is very popular and fishing and kite surfing and jet skiing and boating and taking beautiful tours to High key or Pigeon creek. 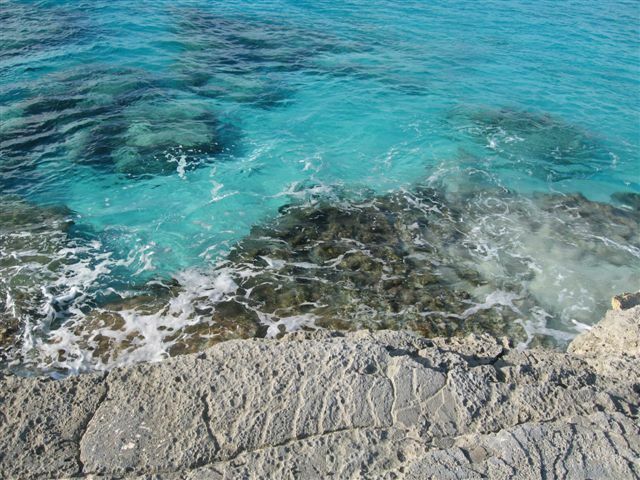 You can visit the light house and go to the caves or just relax and enjoy the beautiful beaches and crystal clear water of San Salvador here in the Bahamas. If I rent a condo or house on the Island of San Salvador, where do I buy my groceries? There are a few little grocery stores/convenience store on the island where all the locals shop and you can get all your basic food there, but you can also bring a cooler with your “favorite food” for home. No shops in Sandy Point or Columbus Landings but 3 in Cockburn town and some in Victoria Hill and United Estates. 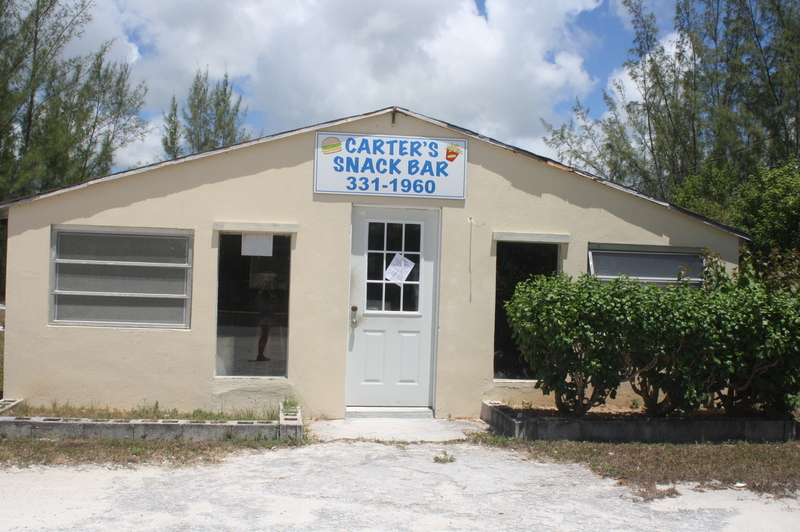 Can a non-Bahamian purchase property in the Bahamas? Yes, you can buy a house or home or condo or vacant land here on San Salvador. The International Persons Landholding Act, 1993, provides for non-Bahamians to be able to purchase real property in the Bahamas. In addition, under the above named act, a non-Bahamian who purchases land that does not require the issuing of a permit must register their purchase with the Foreign Investment Board. Am I required to register my San Salvador property purchase? Yes, your lawyer will help you with it. Non-Bahamians should register their investment with the Exchange Control Department at the Central Bank of the Bahamas so that in the event that they choose to sell their property, they will be able to repatriate the proceeds in the currency of their original investment. What form of property title is given in the Bahamas? Most of the properties are sold on a Freehold basis; however, there are some properties that are sold on a leasehold basis which are usually Crown Lands (Government owned properties). 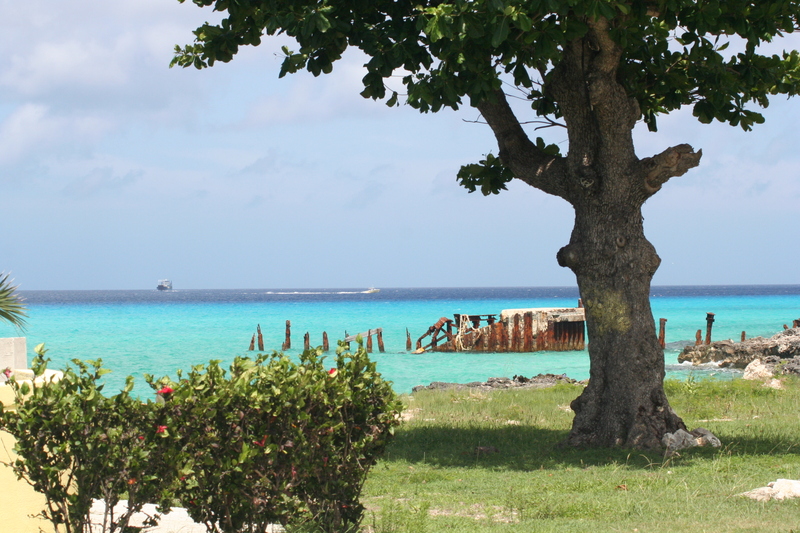 Although the Government of the Bahamas does not usually sell its property, it sometimes leases some of its Crown Lands for agricultural / development purposes. Will I be required to use a local attorney when purchasing property in the Bahamas? It is essential, that all real estate transactions be handled by a Bahamian attorney, or the transaction will not be registered and the sale will not be considered final. In addition to making sure that the title documents are prepared properly and that they are in good order, the attorney will give an Opinion on the title to the property. This Opinion is considered to be the same as title insurance and the lawyer is held liable should the purchaser find that there is a defect in the title. Local Bahamian lawyers carry indemnity insurance. What are the costs related to buying or selling properties in the Bahamas? There are the principal costs in buying and selling real estate. There are other considerations and expenses related such as the conversion from Bahamian Dollars to U.S Dollars and vice versa, surveying fees if boundary markers are not in place or a survey plan is needed. Appraisal or valuation if required is charged by the extent of the job. 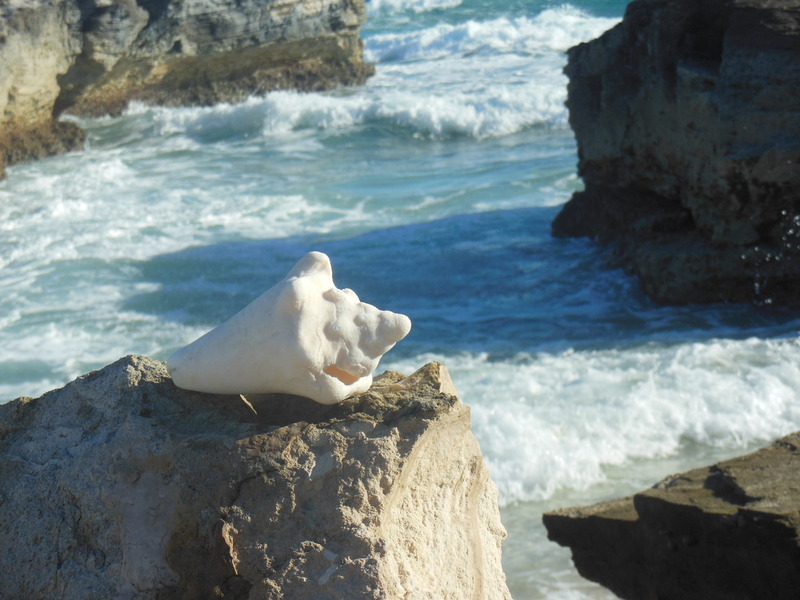 Will I be able to repatriate the proceeds if I choose to sell my property in the Bahamas? If you registered the purchase of your property with the Exchange Control Department at the Central Bank of the Bahamas at the time of purchase and later decide to sell your land you will be able to repatriate the proceeds. Is there financing locally available to non-Bahamians / permanent residents for the purchase of property? What taxes are there in the Bahamas? The Bahamas has no income tax, capital gains tax, inheritance tax or sales tax with the exception of the Stamp Duty on the conveyance of real property. The first $250,000 is tax exempt. On that portion in excess of $250,000 and less than $500,000 the rate of tax is 0.75% (¾%) of the market value of the property. On the portion in excess of $500,000 the tax rate is 1% of the market value of the property. The maximum annual tax shall not exceed $35,000.00. Upon that part of the market value that does not exceed $3,000 a fee of $30.00. Upon that part of the market value which exceeds $3,000 but does not exceed $100,000 a tax rate of 1% per annum of the market value of the property. Upon that part of the market value that does not exceed $500,000 a tax at the rate of 1% per annum of the market value. Upon that part of the market value in excess of $500,000 a tax at the rate of 2% of the market value of the property. Market Value is defined as the amount the property would realize, if sold in the open market, without any encumbrances or restrictions. If the return is not filed, the owner is guilty of an offense, and upon conviction thereof, may be fined up to $3,000. Persons knowingly making false statements may be liable upon conviction to a fine of up to $3,000 or six months imprisonment, or both fine and imprisonment. If the tax is not paid on or before the last day the tax becomes due, a 10% surcharge is added. 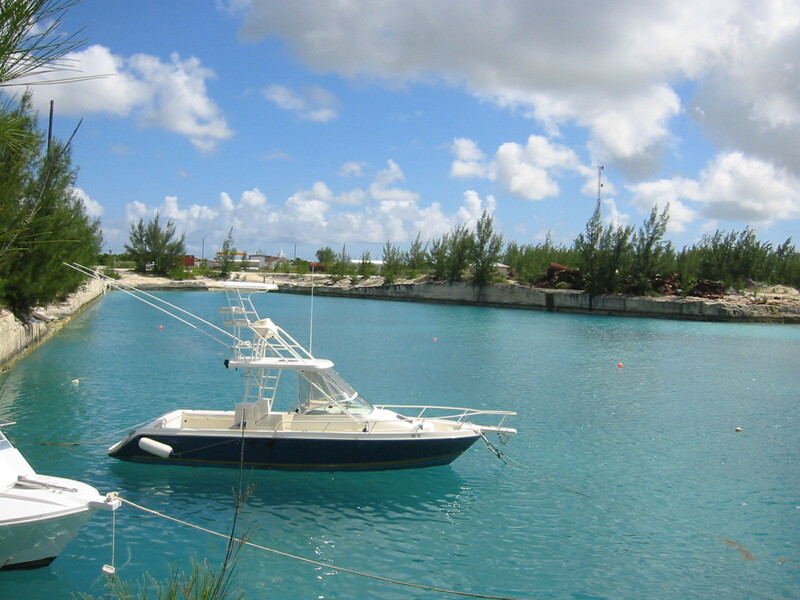 Property owned by Bahamians and situated in the Family Islands is exempt from property tax. Property approved as commercial farmland (by the Ministers of Agriculture, Trade and Industry and Finance) is eligible for property tax exemptions. Property used exclusively for charitable or public service from which no profit is derived. Can I establish residency ? As with many emerging nations, the policies of The Bahamas Government are aimed at ensuring reasonable security, well-being and economic progress of The Bahamas and its people. However, due to our status as an offshore financial center which is utilized by persons from various parts of the world, The Government does give consideration to application for citizenship, permanent residency and work permits subject to applicable immigration laws and governmental policies. Persons seeking permanent residence must be of good character and prepared to show evidence of financial support. Application is made to the Ministry of Public Safety and Immigration and must be accompanied by the necessary information. 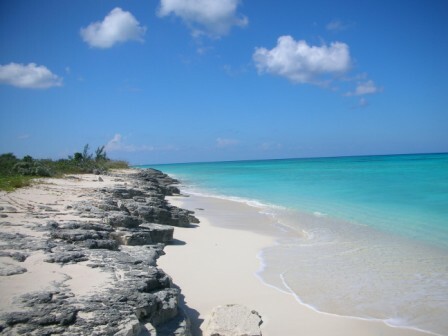 Accelerated consideration may be given to fit and proper applicants for permanent residence who demonstrate a genuine intention to reside in The Bahamas at least part of the year and which applicants either already own or intend to purchase a home in The Bahamas with a value in excess of $500,000. Any successful applicant, where applicable, may have his spouse and/or minor children endorsed on his permanent residence certificate. Non-Bahamians are at liberty to apply for work permits but they must be able to demonstrate a special skill or expertise such that at the time of application there are no suitable Bahamian persons capable of holding the position for which the permit is being applied for. Certain categories of Work Permit applicants may request a permit for longer periods than the standard one-year period. Upon each renewal sought the criteria that was applicable to a new applicant will be required to be met. Should Work Permit applicants wish to be accompanied by their spouse and/or minor children, separate Residency Permit applications must be made. Insurance in The Bahamas is as much a necessity as in other parts of the world. Banks require various kinds of insurance to finance purchases of buildings, equipment, motor vehicles, boats, business interests or other material things. If one were interested in buying a house on San Salvador here in the Bahamas, the bank manager would normally ask one to provide satisfactory security in the form of a mortgage over the property and building, backed up by life insurance to cover the full amount of the loan and insurance on the building, with both policies endorsed to pay any losses arising to the bank. Similar requirements apply to other purchases for which one must borrow money. Premium rates, therefore, may be somewhat higher than those available for similar risks in Florida or the states to the north, but their premium base is vast in comparison to ours. Nevertheless, coverage available from insurers is quite sophisticated and very much in line with what is available elsewhere in the world. Fire and household policies will all contain the “Pro Rata Condition of Average” (commonly called the “Average Clause”), which requires the policy holder to insure for full values if he wishes to receive “full value” for any claim made for loss or damage caused by an “Insured Peril”. Reinstatement, public authorities, and a variety of other clauses amending and/or extending the standard policy coverage are available. The possibility also existed that full cover from windstorm may not have been available to all properties to be insured. With the visit of Hurricane Andrew in August 1992 and Hurricane Floyd in September 1999, the Bahamas could no longer claim to be “specially” favored, as the last serious hurricane to hit major inhabited areas of The Bahamas previously was in 1929. Because of a variety of factors, primarily the cost of reinsurance protection purchased by primary (or direct) underwriters who retail insurance to the general public, the inclusion of any of the “perils of Hurricane, Windstorm, Earthquake or Tidal Wave” (known as “catastrophe perils”), puts premium costs at the top level of the rates agreed by underwriters participating in the local market. Market rates in 1999, for full cover on a typical building constructed of concrete and roofed with wood or fiber-glass shingles in New Providence equal 0.80% on buildings and 1.10% on contents. In the Family Islands: buildings-1% and contents-1.35%. Therefore, the premium on a building in New Providence valued at B$100,000 with contents of B$25,000 would be B$1,075.00 or B$1,337.50 in the Family Islands. A building valued at B$500,000 with contents of B$50,000 in N.P. would have a premium of B$4,550, or B$5,675 in the Family Islands. In practice, however, premiums of B$1,000(N.P)/B$1,250(Fam. Is.) and B$3,675(N.P.)/B$4,600(Fam. Is.) respectively, could be obtained. A shop retailing non-hazardous merchandise in a similar building with similar sums insured will attract a similar premium on the same values. 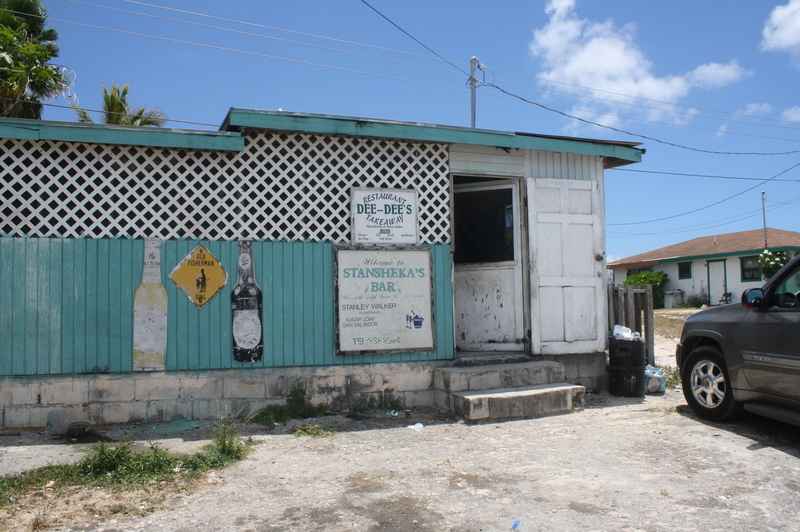 Wooden buildings attract higher rates of premium throughout the Bahama Islands. 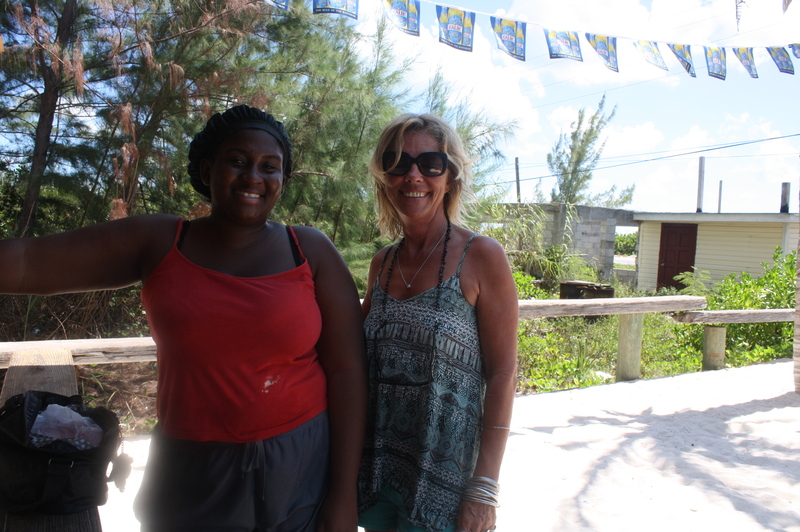 What You Need To Know About Immigration to San Salvador Bahamas. Bahamian immigration rules are designed with the view that everyone wants to immigrate to the tiny Bahamas? which, if this were to occur, would sink under the weight. Consequently, while tourism and investment are encouraged, true immigration is possible but tightly controlled. Visas, work permits and residency permits are available. Everyone entering The Bahamas MUST fill out an embarkation-disembarkation card usually provided by the travel agent, airline or ship. Non-residents surrender the specified part when departing. Canadian citizens, United Kingdom subjects and those of British Colonies unless stay exceeds 3 weeks. Persons possessing a valid Bahamian residence or work permit from the Director of Immigration; persons in transit including stateless persons with valid refugee and stateless person documents if they have tickets onward and stay no longer than three days. Applications should be made to the nearest Bahamian or British Consular Office. Citizens of Haiti and South Africa ALWAYS require visas, even in direct transit by air. All Communist countries, Dominican Republic except in transit, Haiti, South Africa. If in doubt, check with the Immigration Department, P.O. Box N-831. Nassau, The Bahamas. Tel. (242) 322-7530. Eight months with proper documents including a return ticket and evidence of financial support. Those wishing longer stays may apply for temporary residence to The Director of Immigration Department, P.O. Box N-831. Nassau, The Bahamas. Tel. (242) 322-7530. 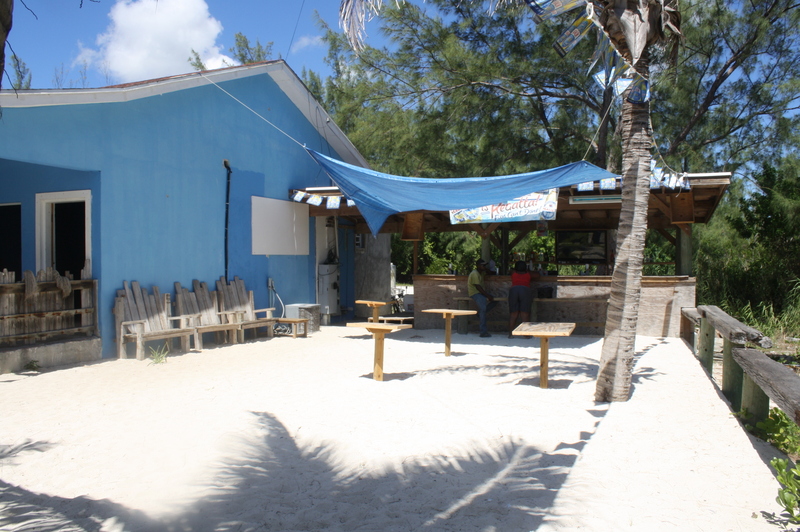 Visitors and temporary residents may not engage in gainful employment while in The Bahamas. Bahamian Immigration Department permits are needed for those who wish to reside, work or engage in business, including selling. Applications must be supported with these documents: A police certificate covering the last five years or in the UK, a sworn affidavit of good character; two character references from responsible persons in the home country or The Bahamas; two full face photographs signed on the back by the applicant (max size 3 x 3 inches; min. size 2 x 2 inches) and a valid health certificate not more than 30 days old. The Bahamas Constitution and the Bahamas Nationality Act, 1973, detail the acquisition and loss of citizenship. Persons born in The Bahamas before July 10, 1973, or outside The Bahamas to a Bahamian father became Bahamian Citizens on Independence Day, July 10, 1973, as did most persons registered as a citizen of The Bahamas under the British Nationality Act of 1948. Persons born in The Bahamas after Independence are citizens if either parent is a Bahamian citizen and are entitled to register as a citizen if born here, subject to interests of national security or public policy, by making application within 12 months after his or her 18th birthday. Persons born legitimately outside The Bahamas after July 9, 1973 to a Bahamian mother and illegitimate children born outside The Bahamas to Bahamian women are entitled to apply between the ages of 18 and 21 years subject to interests of national security or public policy. Any woman married to a Bahamian is entitled to be registered as a citizen upon application provided she is still married to that person and subject to interests of national security or public policy. Others who are not entitled to be registered or naturalized by virtue of an existing status may apply for citizenship under the Nationality Act. Residence for a period, English proficiency and the intention to make The Bahamas a permanent home are among the qualifications. A head of household pays $1,000 plus $25 per dependent. Applicants for annual residency status must show evidence of financial support. Male spouses of Bahamians pay a one time fee of $250 with no charges for dependents, and with proper documentation, may work here on a spousal permit. Those who wish to settle in The Bahamas by investing in property, retiring here or opening a business usually apply for this status. Accelerated consideration for Permanent Residency can be obtained with a minimum property investment of $500,000. Applicants must be of good character, show evidence of financial support, and say in writing that they wish to live permanently in The Bahamas. Wives and dependent children (under age 18) usually resident in a household can be endorsed on the certificate when the original application is made or later, subject to conditions which may be made by the Immigration Board. Persons with this status prior to the Immigration Act (1975) continue to hold the status automatically. Spouses of Bahamians can receive a Certificate of Permanent Residence with the right to engage in gainful employment at any time for females and after five years of marriage for males. Spousal permits may be obtained in the meantime at a cost of $250. Permanent residency can be revoked for cause including divorce. Cost of Permanent Residence is $10,000 before issuance, with endorsements free. The Bahamas Government tries to ensure that Bahamians are given fair consideration for employment. A work permit application is not considered if a suitably qualified Bahamian is available or if the prospective employee is already in the country and entered as a visitor. If the Immigration Board considers the prospective non-Bahamian employee will be an asset to the Bahamas it reviews the application, but only after the prospective employer advertises and interviews locally and obtains a certificate from the Labour Exchange stating there is no qualified Bahamian registered who could fill the post. Permits for longer than one year may be given for key personnel on contract, often with an endorsement that the employee will be replaced by a Bahamian or will train a Bahamian to perform the job in a specified time. The information on this website is believed to be true and accurate but I urge you to do your own research and verify the facts. Just a few days ago the announcement was made that five new national parks are added to the Bahamian park system. All of them in San Salvador. This is a big step for the Island and towards preserving it’s incredible beauty. The San Salvador Living Jewels Foundation has been working towards this goal for many years and finally they got rewarded. The Bahamas are really steeping up their efforts to protect mother nature. 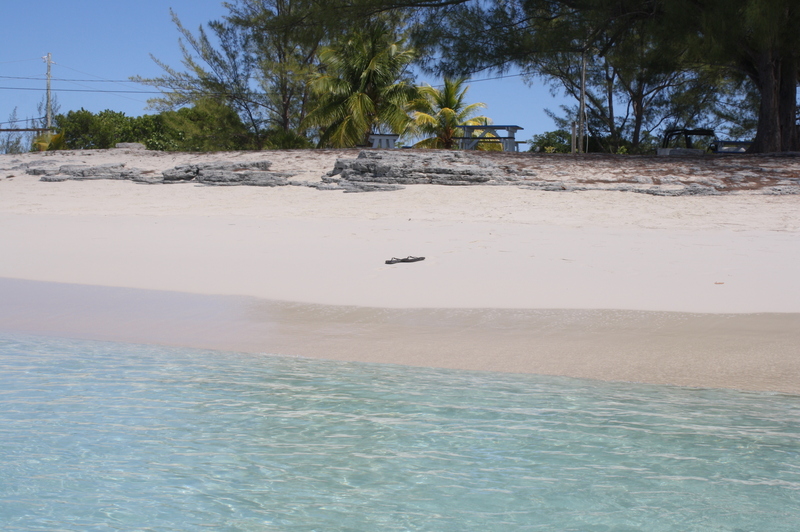 Graham’s Harbour Iguana and Seabird National Park – protect iguanas, the highest diversity of seabirds in The Bahamas, in addition to healthy reef systems and sea grass beds. West Coast Marine Park – protect an extensive coral reef system, including a spectacular coral wall and vertical drop to more than 13,000 ft, popular dive sites on San Salvador, the critically endangered hawksbill turtle, tropic birds, shearwaters and a migratory route for humpback whales. Pigeon Creek & Snow Bay National park – protect the only tidal creek on San Salvador, Pigeon Creek, and an indispensable nursery area to support fisheries stocks. Green’s Bay National Park – protect sea grass beds, and a major iguana population.